I swear, it wasn't my intention to post another puff pastry recipe... but after Christmas there was a nice puff pastry sale in the small shop down the street and I just couldn't resist! I bought many packs and now I got to use them! 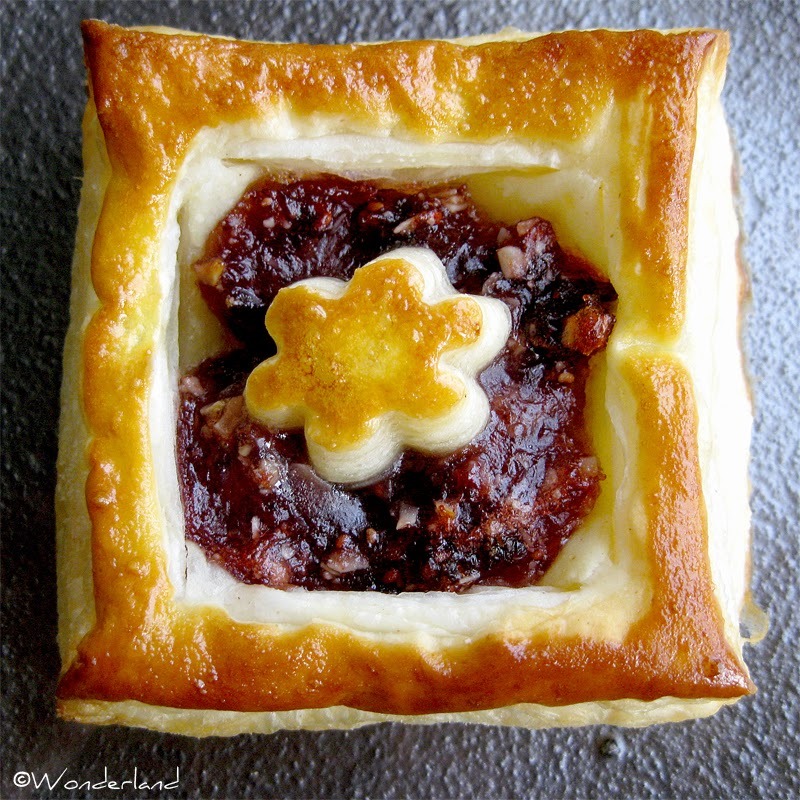 I has some leftover jam and raisins so I decided to make something a bit more interesting than the usual Christmas Tarts (recipe can be found here). I remember this recipe was originally in a local food magazine one or two years ago. 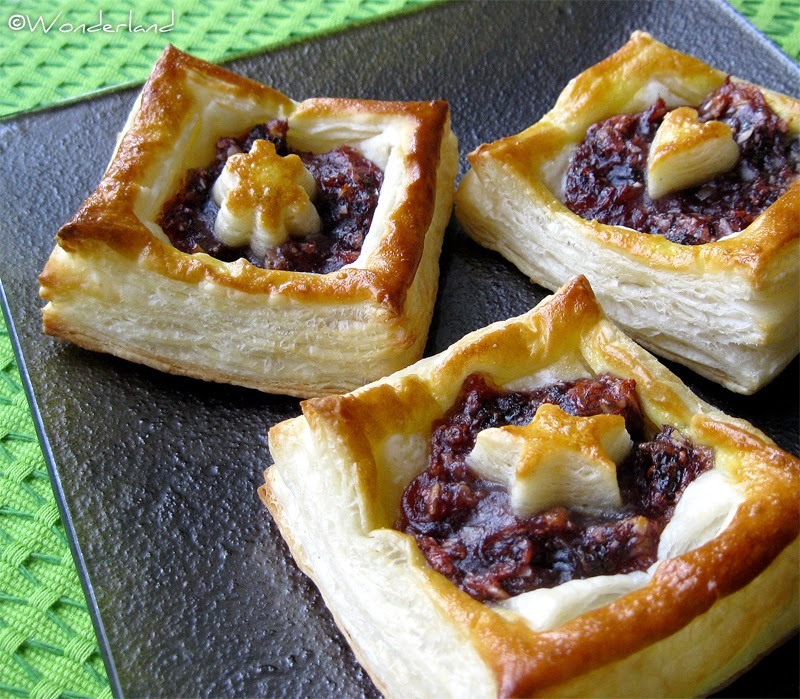 HINT: Better use a kind of jam suitable for oven baking, so it won't liquefy that easily. Crush the almonds finely and chop the raisins finely as well. Mix all together with the jam. Take the frozen puff pastry sheets from the freezer, place them on a sheet of oven parchment and let them be at room temperature for about 15 minutes (or follow the package's instructions). Cut each pastry sheet into 2 squares. Save one square for the decorations! With a small cutter, cut 7 shapes from this square. With a sharp knife, make cuts along the sides of the squares without cutting the corners too. Make them a bout 1 cm from the outer border. This way the pastry rises all around and leave a nice "hole" in the middle for the jam. Brush the sides of the pastries with lightly beaten egg. 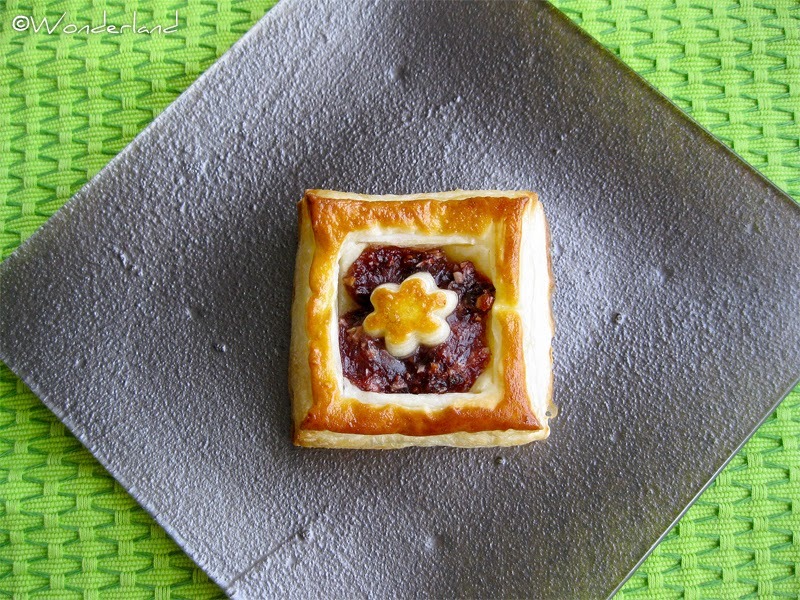 Place a teaspoon of jam in the middle of the tarts and a small shape that we cut previously on top of the jam. Brush that too with the egg. Bake at 225º C (437º F) for about 10-15 minutes, until the pastries have gotten a nice color. Italian living in Finland with a passion for good food and bento making. I am Wonderland, I enjoy cooking simple and tasty food for me and my family. I especially love pasta, pizza and chocolate. If you try one of my recipes please leave a comment and let me know your opinion!